Our Review of the Jimu Robots BuilderBots Kit, plus a special book announcement! By now, I have reviewed two Jimu Robot kits already, including the Tankbot and Buzzbot. 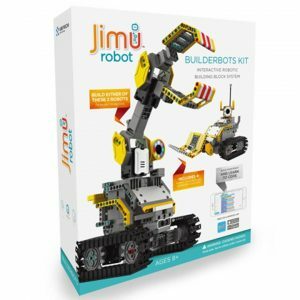 For those who need a quick refresher, the Jimu Robot kits are these building kits similar to LEGO MINDSTORMS, and these creations can be programmed to do all kinds of things, with the controls being on the user’s smartphone or tablet. I recently got a chance to try out the Jimu Robots Builderbots kit. For reasons that I will get into later, I will explain why I didn’t review it earlier. The Builderbots Kit has two basic robots that you can see on the box. The first is the Grabberbot with the big claw, and the other is the DigBot that looks like a small bulldozer. These came with special instructions that you can download off the Jimu Robots app, which tells you via 3D instructions how to build and program. Of course, there is nothing new about that, as you can read in my other Jimu Robots reviews. The reason why it took so long for me to review this product is that the instructions took a while before they appeared on the Jimu Robots app, not to mention the product on the Jimu Robots site. It took a while, but the review unit that I was sent months ago is ready to go, and I like it a lot. There are a lot of colored pieces that are great to work with, and I enjoy the Sensor (also in the Tankbot kit) as well as the LED light. The LED light is very great as it can shine with many colors, and even create these emoticons. You should be able to purchase the Builderbots kit on the Jimu Robots website for about $99.99. That is quite a bargain for a construction kit like this, and for two reasons, I will recommend it. Yes, here is the second reason! It is time for me to announce my 8th published work! 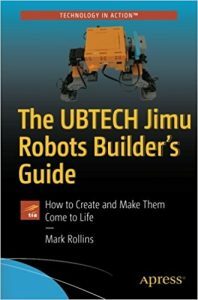 This is The UBTECH Jimu Robots Builder’s Guide: How to Create and Make Them Come to Life. This has been quite a journey for this past year. I pitched this book last year after I reviewed the Buzzbot/Muttbot and Tankbot kits, and it fell through by Christmas. Then, sometime in January, it looked like it would happen again. And so it did. I had a chance to try out just about every Jimu Robot kit available, and then I combined them all to write a book about them. The book goes into detail about each piece, and then how to get these pieces together to do all kinds of things. For example, I have a chapter on how to make a vehicle and make it drive, as well as one on how to make a walking vehicle. There is an entire section on coding, as well as other special projects. Yes, I had a lot of fun writing it, and it took a lot of work. It is available on Amazon now, and of course I encourage you to check it out.